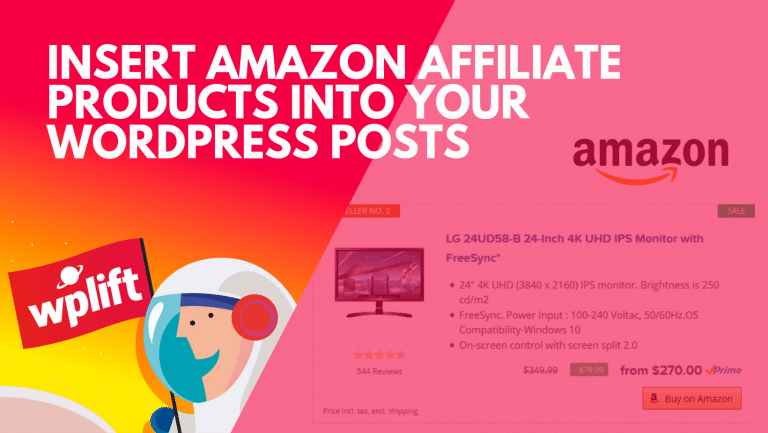 Amazon Affiliate for WordPress ( AAWP ) is a plugin which allows you to pull Amazon product information into your WordPress website and monetize it using affiliate links generated by joining their Associates program. The links are generated dynamically and then cached so you will always display up to date information – things like price, description, images and so on, this means no more outdated information for your site visitors. The plugin will let you create simple text links to products, product boxes with image and information, best seller lists and comparison tables. You can place the items using the shortcode system or the included widget. The design and output is customizable so you can tailor the plugin to what you want to achieve – change buttons, HTML, CSS and other details. Amazon Partner Networks – The following Amazon Partner Networks are supported and can be selected through the plugin settings: Germany, USA, UK, France, Japan, Italy, Canada, Spain, India & Brazil. Tracking-ID -Your tracking ID shall be deposited in the plugin settings and automatically used in the generation of all affiliate links. Per shortcode you can specifically override the tracking ID in case you want to perform any kind of A / B testing. Automated Data Retrieval – The product information such as name, description or current price are retrieved automatically via the Amazon Product Advertising API. Here, you can decide yourself how often the data is updated. This means no more worrying about manually updating your own prices or descriptions. Caching – In order to reduce loading times, the plugin comes along with its own caching functionality. After retrieving product information they will be temporarily stored (everything except images) and delivered immediately on the next page visit. The caching duration can be adjusted via the plugin settings. Text links – With text links you can issue a specific product name inside your content. Here, the corresponding link and output name are generated automatically. The product name can be overwritten manually. Product boxes – Do you want a specific Amazon product to be displayed in a single post or page? With one shortcode you can easily display one or more visually appealing product boxes. Features included in the product boxes are for example: title, description, current availability and prices, discounts and call-to-action buttons. Bestseller (lists) – With the bestseller lists you can deliver a really strong selling reason to your visitors by listing the best-selling products to a specific product group or keyword. In addition, you have the ability to set the number of products individually: e.g. Top 3, Top 10 etc. New Releases (lists) – What about attracting your visitor’s attention towards the latest products within a specific product group? Just like the bestseller lists, you have the ability to set the number rankings of the products themselves. Fields – Using “Fields” you can place individual product information (such as the title, description, current price or buy button) anywhere in your posts / pages. These can also be used directly inside your templates files via the provided PHP functions. Widgets – In order to Integrate items into your sidebar, widgets are available to assist you. Here you can choose between the core functionality listed above. If you need more adjustments, you can alternatively place the shortcodes in a text widget (or Visual Composer) too. Different styles – From the start, you can choose between different styles: Standard, Light and Dark. Additionally it’s possible to custom the output via CSS. Therefore we prepared a handy box on the plugin settings page. Titles – You can limit the number of characters appearing in the product title or determine the title itself. Additionally you can attach extra characters (such as an asterisk *), which gives you the ability to add a reference to affiliate links. Descriptions – Product The Amazon API provides product descriptions in the form of a bullet list. You can adjust the total number of list items, and the number of characters per line (similar to the titles). In addition, you can use your own product description (incl. HTML formatting). Reviews – The output of the star rating and the total number of submitted reviews can be enabled/disabled via the plugin settings. Price – The sales price and possibly available price reductions can be hidden via the plugin settings. 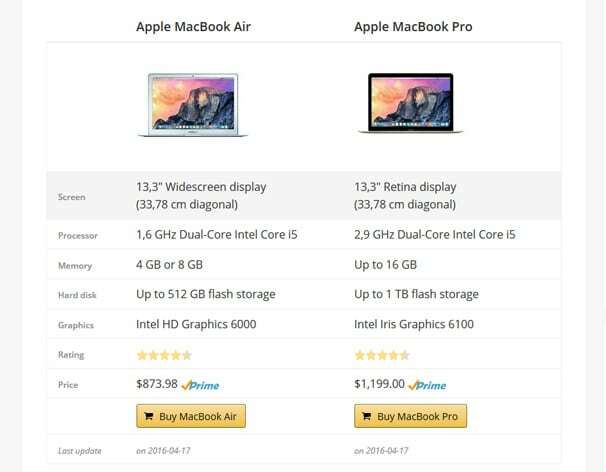 With the price reduction, you also have the choice to display the values as a percentage or in EUR/USD etc..
Amazon prime service – For products which can be ordered as part of the Amazon Prime service, the Prime icon is displayed next to the selling price. This feature allows you to improve conversion and increase your commisions for new prime signups. However the prime logo can be disabled via the plugin settings. Buy now & detail buttons – The appearance of the “Buy on Amazon” button can be customised: Choose between different styles and/or adjust the displayed text (changing completely or adding an asterix * for example). Additionally to the normal buy button you can add a second button, the socalled “Detail Button” which can be used to place custom links for reviews, internal/external urls etc. PHP-Templating – If you want a completely different presentation of the products, you can tweak them using integrated PHP templating. This means you still have the ability to make individual and specific changes – according to your needs – to the output of product boxes, lists, and widgets. Once you have uploaded the plugin and activated it, visit the plugin settings page and enter your license key which you will receive in the welcome email. 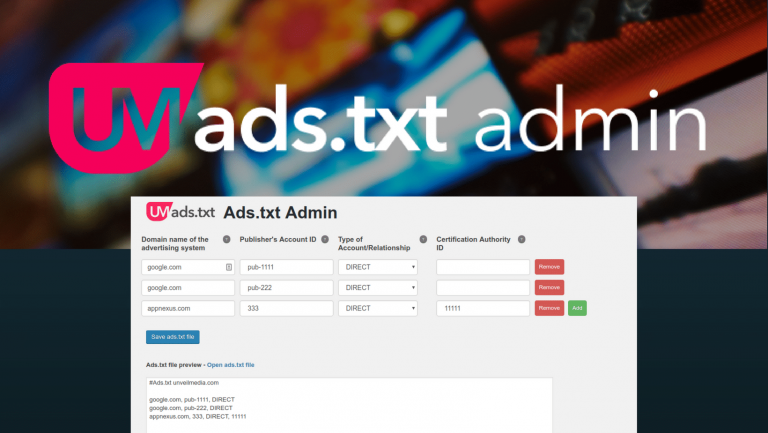 The next step is to connect an “Amazon Advertising API”, if you haven’t already got one, you can signup for this here on the Amazon website. You will also need to signup for Amazon Web Services to create the API keys and you will also need an Amazon Associates account which is what handles your affiliate commissions and payouts etc. Once your account is connected, you should choose which country you would like to use from the dropdown box, and also enter your associates ID in thebox to make sure that your affiliate ID is added to all outgoing links so you will be compensated for any sales you send. Once your account is connected, you should visit the “General” tab where you can configure some options for the plugin – you can choose which shortcode to use, the cache duration ( how often pricing & info is updated) and which type of affiliate link to use, you can choose between standard and shortened at the moment – there is an option for cloaked but it says coming soon for that feature. You then have the option to enable SSL support and AMP support and choose a last update format – Date or Date and Time. If you wish to include some inline info which will be included when you place the shortcode, there is a text editor to do so – you can also disable it here. Finally, there is a disclaimer area to provide info to site visitors letting them know that the links are affiliate links. You can also disable this if you want. You can also choose to display the Amazon prime logo next to a product if its available, choose a button type and style, there is also space for you to add your own custom CSS if you need to modify it to match your theme better. Preview your page and you will see the shortcode has been converted into a link using the item’s title from Amazon. If you want to add a best seller list of products, you can do so using keywords or Browse nodes, Browse nodes are better so you can get the exact category to use. You can find a list of these online here. Here is the shortcode to use for this, note you can also specify how many items to output. If you want to list new releases from different categories, you can do that also. Pricing for AAWP starts at 39 Euro for the standard license which is valid for one domain and includes one year of support and updates, the Business plan is 99 Euro and is for 3 domains and includes multi-site usage. The Developer plan is unlimited domains and is allowed for client projects as well. The plugin is well documented online here, FAQs are also available and support and pre-sales questions are handled via a ticketing system on the form on this page. This is a very polished and well made plugin – everything operates exactly as it should, easy to configure with a good amount of customization options. The resulting output looks good and should fit in well with any theme you choose to use – having the option to tweak it with some custom CSS is a bonus if something is not displaying quite right for you. Including Amazon links in your posts can be quite lucrative, I personally have earned a lot of money from the Associates program – if you have a website or blog which talks about products quite often, using this plugin can add an extra later of monetization to your site. I found that over Christmas and Black friday sales go through the roof so by using this plugin you should be able to make some extra money which in turn will pay for the plugin cost. I found the plugin developer friendly and helpful in the course of reviewing this plugin so you will be in good hands if you ever require any support. Does this plugin have the option to localize Amazon affiliate links? I presume not because it would be mentioned in post. Hey Kasa, thanks for your comment. Geotargeting is already on the list but not yet implemented due to the fact that we want to make it bullet proof especially when using caching plugins. I guess users can always use Genius link as third party tool until you implement it with your plugin (if you decide to add). Yeah I’m already aware of Genius Link and think about an integration. It seems to be a very cool idea! Great to see an awesome plugin for affiliate marketers. Amazon is the best when it comes to build a niche blog to make money and many bloggers are making huge money. This plugin will definitely help to build a micro niche blog on any Amazon product. Thanks for your words Santanu. We know a lot of successful affiliate marketeers reaching a huge income with the Amazon Associates program.